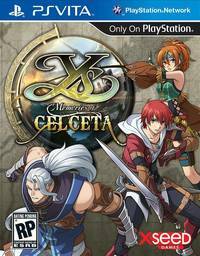 PlayStation Vita exclusive Ys: Memories of Celceta launches today in North America. Following the daily pre-release character vignettes of the last week, XSEED has one final trailer starring the main protagonist, Adol Christin. XSEED goes through a brief history of the 25 year old series on the PlayStation Blog, detailing the origins of the series and how the games have evolved over the years. Most importantly, XSEED discusses how most Ys titles can be enjoyed independantly, and that Celceta is as good a place as any to jump into the series. You can check out the launch trailer here. Those in Europe will have to wait for Ys: Memories of Celceta to release sometime in early 2014, published by Nippon Ichi Software America.